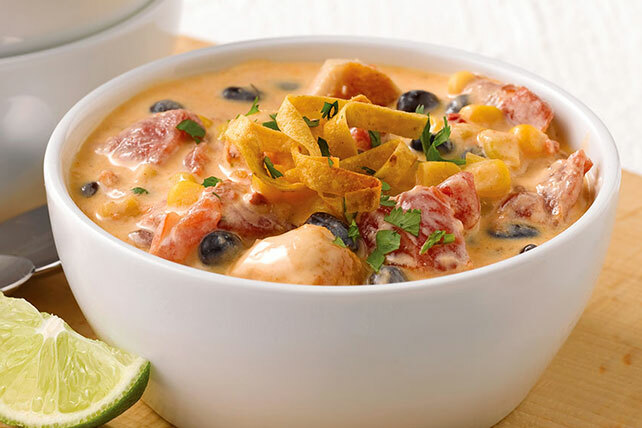 Warm up with this enchilada-inspired Southwestern stew, made with chicken, veggies and beans in a creamy broth, topped with the perfect amount of crunch. Toss tortilla strips with oil; spread into single layer on rimmed baking sheet. Bake 10 to 12 min. or until crisp, stirring occasionally. Meanwhile, mix cream cheese spread, 2 Tbsp. milk and taco seasoning until blended. Cook chicken in large saucepan sprayed with cooking spray on medium-high heat 8 to 10 min. or until done, stirring frequently. Stir in cream cheese mixture, remaining milk, beans, corn and tomatoes; simmer on medium-low heat 6 to 8 min. or until heated through, stirring frequently. Serve topped with tortilla strips and cilantro. Serve this hearty stew with a tossed leafy green salad. Serve with lime wedges to give the stew a little citrus kick.